July 18th in Wordpress Plugins by Wordpress Jedi . WooCommerce makes it so easy to bring your store online. There are also a ton of extensions available for it that add additional features to your store. 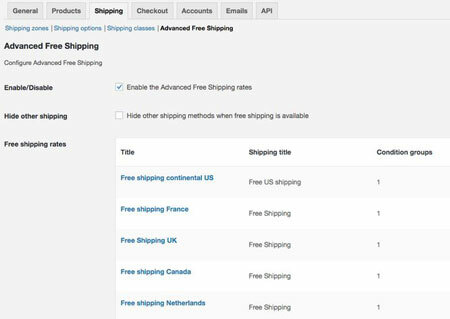 Take the WooCommerce Advanced Free Shipping plugin for instance: it is a handy script that lets you set up free shipping rules. You will be able to use this to offer free shipping to your customers based on quantity, zip code, weight, category, and other conditions. The plugin allows you to set up ‘OR’ and ‘AND’ conditions to handle complex scenarios. You can try this plugin for free or combine it with others to display free shipping messages and handle even more advanced scenarios. More info is available here.